It is estimated that, in the European Community, the equipping of all trucks and buses/coaches with electronic systems would result in 500 fewer deaths and 2,500 fewer injuries due to road accidents per year. Knorr-Bremse is pressing ahead with the development of active and passive driver assistance systems and is thereby making a significant contribution to increasing safety on the roads. The product program in the area of electronic systems ranges from legally required ABS (anti-lock braking systems), through EBS (electronic braking systems) to ESP (electronic stability program) and ACC (adaptive cruise control). ABS prevents locking of the wheels when braking, while ASR (traction control system TCS) ensures that, when accelerating, the wheels on the drive axle do not spin, thereby ensuring optimal traction in all driving conditions. 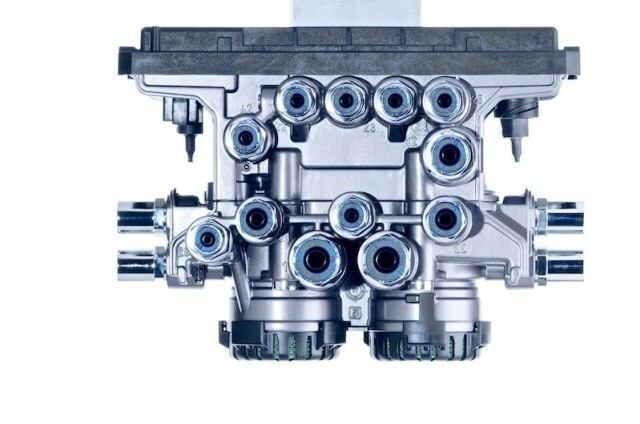 As a pioneer in the development of ABS systems for commercial vehicles, Knorr-Bremse provides ABS and ASR systems for all vehicles types and trailers with air braking. EBS integrates the basic functions of braking control, ABS and ASR, into one electronic system. The advantages of electronic control over conventional pneumatic control are shorter response time and braking distance – resulting in increased road safety. The electronic braking system (EBS) has additional functions such as control of wear, downhill cruise control and Coupling Force Control (CFC), a system that distributes optimal braking power between a tractor vehicle and semi trailer. Knorr-Bremse offers EBS and CFC for all vehicle types, including trailers. The enhancement of EBS by ESP (Electronic Stability Program) causes automatic stabilization of the vehicle in critical driving situations and thereby also a considerable reduction in the risk of tipping over or skidding. With ESP, the direction of travel and speed of the complete combination is automatically corrected in dangerous situations. By selective intervention to individual wheel brakes and in engine management, ESP provides an automatic support system for the driver in critical situations. Knorr-Bremse is the first company in the world to offer an ESP system even for trailer combinations, so-called articulated trains. The technical challenge: unlike a semi-trailer, the articulated train with trailer connector and pivot plate has two articulations. This additional degree of freedom allows a variety of differently working forces to come into play, which ESP has to deal with. Electronic Leveling Control (ELC) offers electronic level regulation and adjustment and also an axle lifting function for vehicles with pneumatic suspension. This development can be used, for example, to lower the level of buses to enable children, the elderly and the handicapped to get in and out more easily. To ease the task of the driver in heavy traffic, Knorr-Bremse offers an Adaptive Cruise Control System (ACC), that automatically maintains the correct distance from the vehicle in front, dependent upon the speed at which it is traveling, which helps prevent rear-end collisions. Furthermore, ACC can ensure more effective use of road capacity.